Summer is here, America’s pastime is in full swing, and the grill is always calling. It’s a match made in heaven, but why settle for basic hotdogs when you can go for it all with Grilled Bratwurst and Special Mustard Sauce. Beautifully grilled, simmered in beer with onions and peppers, and topped with tangy mustard sauce, these brat’s are the ace to your game day grilling. 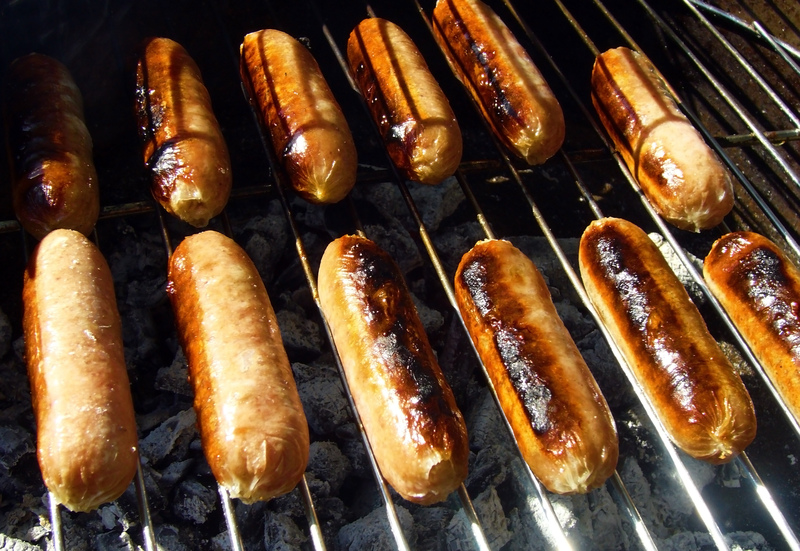 Begin with large bratwurst links and grill until thoroughly cooked and beautiful grill marks. Thin sliced onions, green and red peppers, and butter are sautéed until tender. Then the beer, seasoning, and links are added and simmered to infuse the rich flavor into the sausage and veggies. The special mustard sauce features cider vinegar and sugar, and is the perfect complement to the brat’s because it cuts through the rich and filling flavors. Assembled on split hoagie rolls, these are legitimate two-fisted sandwiches that burst with juicy goodness in every bite. So fire up the grill, grab your baseball cap, turn on the game, and let’s get grillin’. Warning: these will get all over your face, in your beard, down your shirt, and maybe on your shoe – a worthy price I’m sure you will agree! Special Mustard Sauce: Combine butter and bouillon cubes in top of a double boiler. Place over simmering water, and cook, whisking constantly, until butter melts and bouillon cubes dissolve. Gradually whisk in beaten egg yolks. Add sugar and remaining ingredients; cook, whisking often, 20 minutes. Cover and chill. Grill bratwurst, covered with grill lid, over medium-high heat (350° to 400°) for 10 to 15 minutes or until thoroughly cooked, turning once. Melt butter in a large skillet over medium heat; add onion and bell pepper strips, and sauté until tender. Stir in beer and seasoning blend; add sausage, and simmer mixture for 20 minutes. Place 1 bratwurst link in each roll, and top evenly with vegetable mixture. Serve with Special Mustard Sauce.